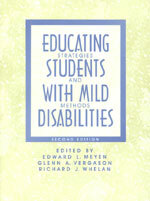 This book discusses the best instructional practices for teaching students with mild disabilities. It provides both general and special education teachers with the latest up-to-date strategies. You'll find curriculum considerations in an inclusive environment and specific interventions. It is empirically based and translates the latest research into classroom practice. It includes learning strategies, curriculum based measurement, assessment, co-teaching, and much, much more.